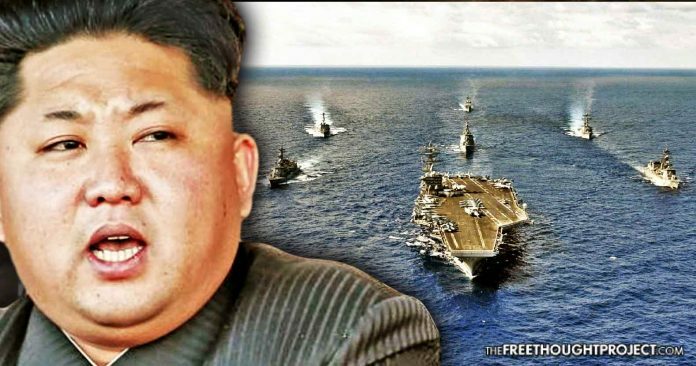 Tensions between the United States and North Korea have indeed escalated nearer the point of no return, as a U.S. aircraft carrier strike group heading for the Korean peninsula in a show of muscle, stopped briefly to perform exercises with ally, Japan — before running headlong into what could quickly turn from boasts to nuclear blows. Reports last week indicated Pyongyang poised and ready to conduct another nuclear missile launch test — against sanctions imposed by the United Nations — in what U.S.-allied nations in the region implore constitutes a direct threat to sovereignty and security. The U.S.S. Carl Vinson carrier group traveled to the area at Trump’s behest as a warning to Pyongyang such a nuclear or ballistic missile test — and worse, preemptive first strike against its neighbor to the South, among other targets — leaves open a potential military response by the U.S.
“The United States should not run amok and should consider carefully any catastrophic consequence from its foolish military provocative act. Posturing this brazenly belligerent, coupled with Trump’s incendiary rhetoric against the secretive regime of Kim Jong-un, apparently set North Korea’s sole major ally, China, in a tailspin, with President Xi Jinping emphatically denouncing any hint of an aggressive first move. In a phone call, Trump and Xi appeared to have moved past the critical rhetoric which had punctuated the campaign of the U.S. president. Pyongyang has carried out multiple ballistic and nuclear weapons tests over the past few years, but more recent launches led South Korea to request the installation of a U.S. missile defense system should its hostile neighbor to the North decide instead to lash out aggressively. Indeed, the harrowing situation has a new urgency, with North Korea set to begin festivities marking the 85th anniversary of the founding of the Korean People’s Army on Tuesday — a massive event involving military chest-puffing from Pyongyang — and, as in previous years, widely speculated to be the impetus for the rumored missile test. Ordinarily cordial relations between Beijing and Pyongyang would have meant a semblance of unity in defense of North Korea — that is, until the Chinese Commerce Ministry suspended imports of coal from February through the end of the year. South Korea also plans to perform joint naval drills with the U.S. in anticipation of the North’s theoretical sixth nuclear test. Except, that ‘armada’ referred to the Vinson carrier group — which was heading in the opposite direction to perform joint naval drills with Australia. With the world’s eyes trained on North Korea and the United States, in apprehension either’s hothead leader could develop an itchy finger to go nuclear, it would behoove the Trump administration to at least inform the president of the location of naval vessels — in the event this reckless saber rattling reaches critical mass. There exists no flippant dismissal of a previous statement Trump could then proffer that could be heard over the din of missiles incoming.